Cobh, pronounced Cove, was called Queenstown when the Titanic docked there in 1912. Reflections and Reactions - Queenstown 1912. A view of what everyday life was like in Cobh, then Queenstown, in 1912 set against the shocking news of the Titanic’s sinking only four days after leaving Cork Harbour. The center piece of this exhibition is the Pilots’ Log Book showing the exact time of arrival and departure of the Titanic from Cork Harbour on 11th April 1912. Titanic Experience Cobh is a new permanent visitor center located in the original White Star Line Ticket Office in the center of Cobh town. Open 7 days a week 10:00 am to 5:30 pm. The last tour is at 4.45 pm. Titanic Experience Cobh is available after hours for corporate events. The machine supplied by Penny Press Ireland (e.mail : pennypressireland@gmail.com). Each penny will cost €1 plus 5 cents. 1. (H) Image of the Titanic with 'Queenstown 1912 RMS Titanic 1912'. 2. 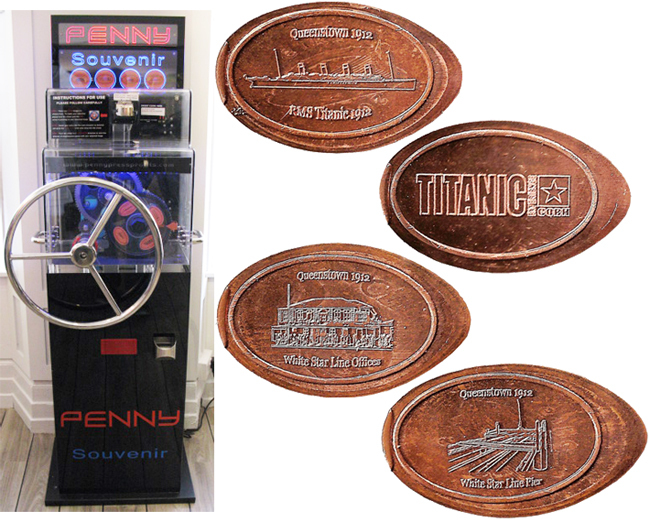 (H) The Experience Logo: 'Titanic Experience Cobh'. 3. (H) Image of White Star Line office with 'Queenstown 1912 White Star Lines Offices'. 4. (H) Image of piers with 'Queenstown 1912 White Star Lines Piers'. G.P.S. coordinates: Latitude: 51° 51' 0.0246" Longitude: -8° 17' 40.902""
Machine details uploaded by David Miller, ukpennies.co.uk.